April 1862, Proposal to form Joint Stock Company, ‘Bantry Bay Slate and Slab Company’ already operational at White Horse, Kilcrohane, under Captain O’Flaherty, used by John Moss, Durrus, in building Glenlough House 1850 and contractor William Murphy (father of William Martin Murphy) in building Lord Clintons Residence at Crookhaven, Testimonials from F Lisabe, W Thomas and E H Blake of Dublin. Taken from a dark microfilm quality poor. Skibbereen Eagle, National Library, Dublin. 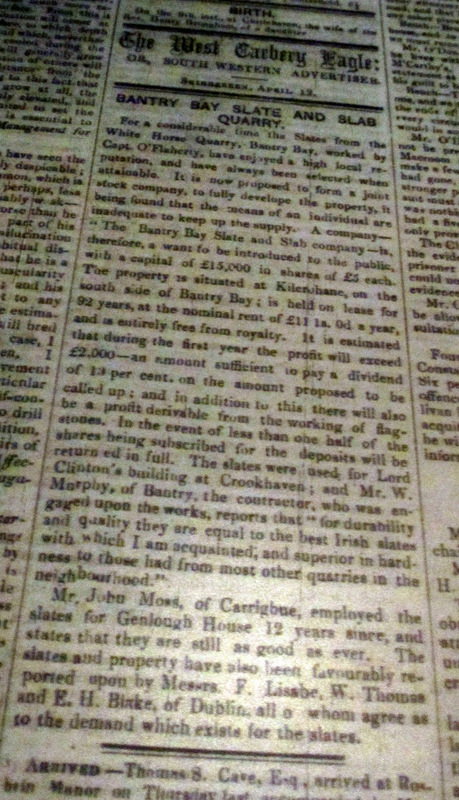 March 1862, Proposal to form Joint Stock Company, ‘Bantry Bay Slate and Slab Company’ already operational at White Horse, Kilcrohane, under captain O’Flaherty, used by John Moss, Durrus, in building Glenlough House 1850 and contractor William Murphy (father of William Martin Murphy) in building Lord Clintons Residence at Crookhaven, Testimonials from F Lisabe, W Thomas and E H Blake of Dublin. The Mosses were prominent in Durrus in the 19th century with pubs and many went to the USA. They possibly originated in Armagh with weaving. Clinton bought lands from the Bantry Estate including Bere Island and came to grief.